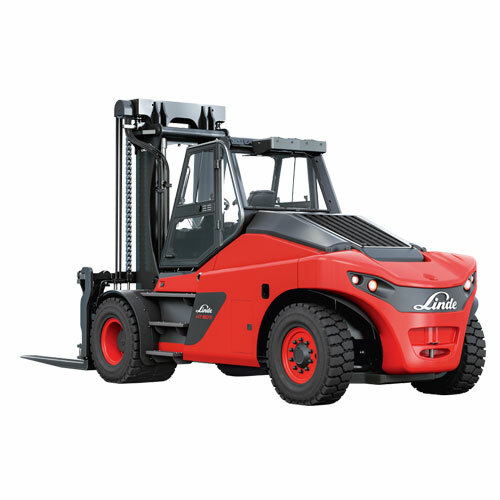 These are Linde-quality, tried and tested forklifts, fitted with intelligent navigation and safety technology produced by the robotics specialists, Balyo. The whole range of models can also be easily maneuvered using conventional manual control. 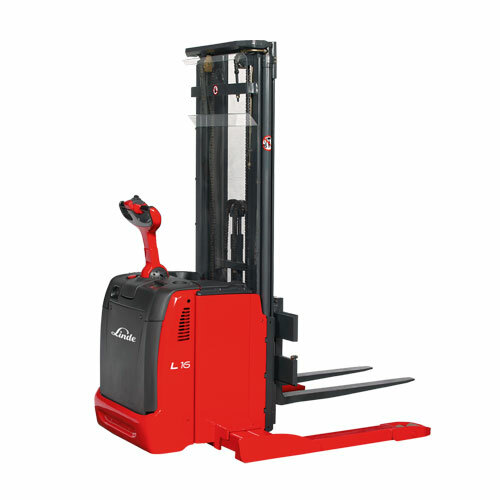 The Linde Material Handling L-MATIC pallet stacker is suitable for storage or removals at low level. 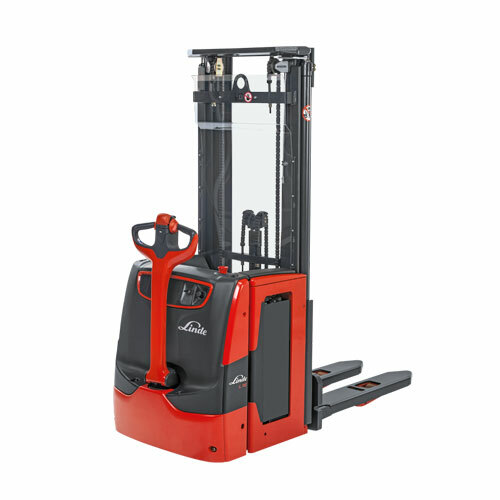 It tackles loads of up to 1,200 kg and lift heights up to 1.9 meters. Thanks to infrastructure free geo-navigation, the L-MATIC can be used flexibly as an individual truck or as part of an automated fleet. 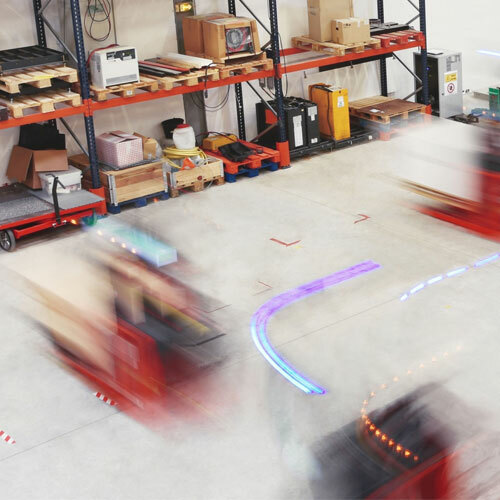 When operating in this manner, the robotic forklift is able to integrate safely and efficiently with people, non-automated trucks or the customer’s infrastructure, such as belt conveyors or packing stations. Furthermore, manual operation is possible at any time, used to, for example, move the equipment away from a dangerous zone quickly in the event of an emergency, or to use the truck to carry out another short-term task. 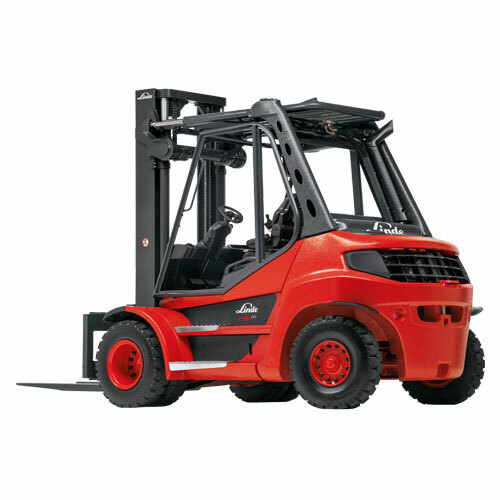 Linde electric forklift trucks offer both comfort for the driver and cost-effectiveness, and all with Linde's trademark safety concept. This includes, among other things, a robust protective zone for the driver and the optionally available Linde Safety Pilot driver assistance system that provides extra safety when handling loads. The three-wheeled E12 – E20 EVO trucks allow for precision load handling in even the tightest of spaces. Thanks to the turntable axle, the driver can turn up to 180 degrees with a single steering wheel movement. Two three-phase motors integrated in the front axle guarantee a powerful drive, offering outstanding acceleration and top speeds, powered by 48 or 24 volt batteries. Linde energy management ensures the batteries are used to full capacity, minimizing consumption. 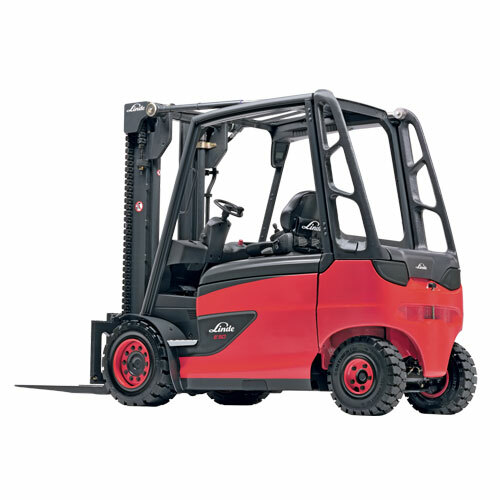 What's more, all E12 – E20 EVO forklift models can also be equipped with lithium-ion batteries that allow for efficient multiple-shift operation without the need to change batteries. The four-wheeled E16 – E20 EVO trucks allow for precision load handling in even the tightest of spaces – with even greater stability. Linde's innovative combi-axle allows the rear wheel turntable axis to be turned through up to 175 degrees, enabling the truck to maneuver on the spot without damaging the flooring. 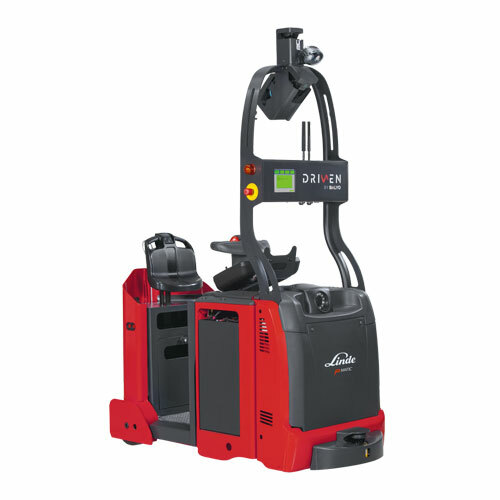 The electric forklift truck is equipped with the Linde compact axle: an integrated unit comprising two powerful drive motors, maintenance-free brakes, and performance parts installed directly on the axle that guarantee outstanding operational performance, while rapid battery changing and high truck availability is assured thanks to the optional on-board charging device. 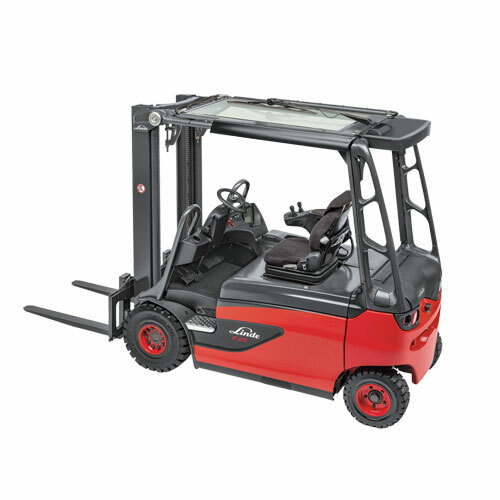 All this allows electric forklift trucks to offer maximum performance with outstanding energy efficiency. 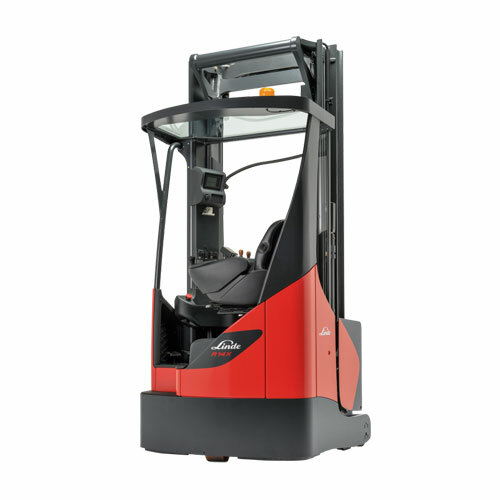 Linde's new E20 – E35 electric forklift truck line is based on a design principle of high throughput in terms of stacking, transporting, loading, and unloading. This is made possible by the compact axle technology, which features two three-phase traction motors integrated into the front axle and maintenance-free brakes. 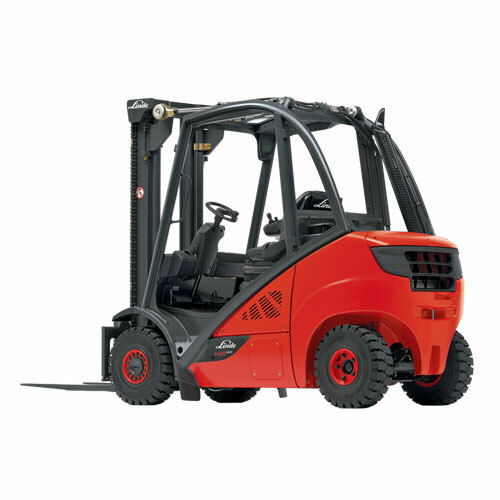 Suitable for loads between 2000 and 3500 kilograms, this forklift series can be adapted for use in almost any application. For example, there is a compact model for areas where space is at a premium, or a tall truck with a long wheelbase for tall, bulky loads. Plus, brand-new Linde energy management technology ensures smart, transparent energy consumption. 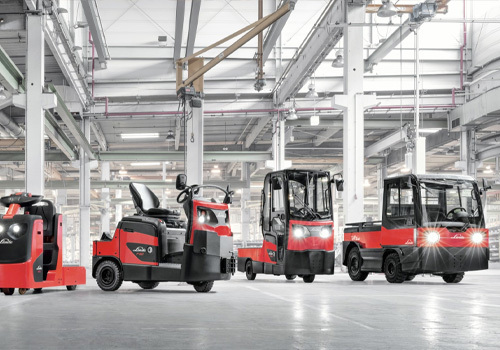 Revolutionizing operational visibility, the new Linde E20 – E35 R roadsters are powerful, versatile forklift trucks suitable for loads of between 2000 and 3000 kilograms. The driver has an all but unobstructed view of their work station, load, and surroundings thanks to the truck's unique design, that sees the cab roof connected directly to the lift mast via the tilt cylinder, avoiding the need for an A-pillar. The two powerful drive motors of the Linde compact axle, the maintenance-free brakes, and other smart performance parts form a single unit that gives this model series its optimal maneuverability and handling. What's more, the new Linde energy management system ensures low energy consumption. 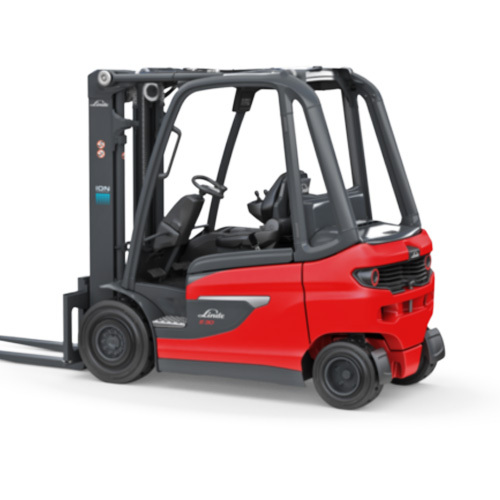 Suitable for loads between 3000 and 5000 kilograms, the Linde E35 – E50 series of high-powered electric forklift trucks meet a wide range of specifications in order to optimally cater for customer requirements. These include, for example, compact models for areas where space is at a premium or tall trucks with a long wheelbase for tall, bulky loads. 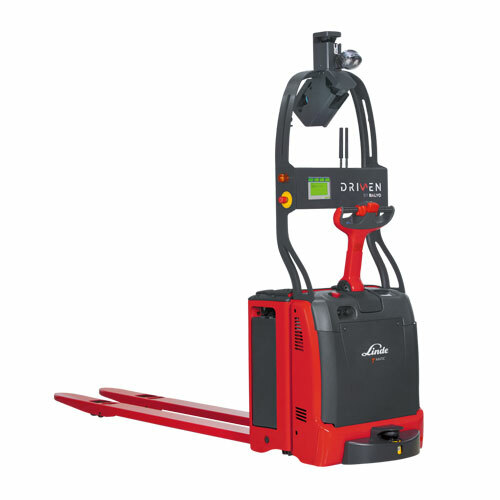 High handling performance is guaranteed, thanks to the two powerful three-phase motors of the Linde compact axle and dual pedal control, while features such as the overhead tilt cylinders, electronic traction control, and on-board high frequency charger bear testament to Linde's commitment to safety and cost-effectiveness. 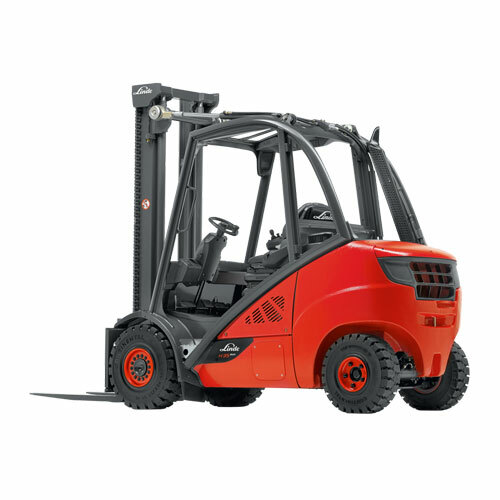 The powerful Linde E60 – E80 forklift models are ideally suited for heavy loads weighing in at between 6000 and 8000 kilograms. The compact axle comprises two powerful drive motors that harness the power of maintenance-free brakes and smart integrated performance parts. Low energy costs, emission-free drive, and minimal maintenance costs all guarantee extremely cost-effective truck usage, while the Linde energy management technology ensures smart, transparent energy consumption. Plus, a display shows residual capacity to allow greater planning accuracy. Operational reliability is increased thanks to the double transmission and control of electronic signals. Safety is yet another essential principle for Linde's IC truck development, leading to a sophisticated design; all parts and components are exceptionally robust while still ensuring optimum visibility. What's more, a range of mechanical and electrical systems enhances both the trucks' active and passive safety levels. Linde's wide range of internal combustion trucks covers a load bearing capacity of 1.4 to 18 tons. The Linde H14 – H20 EVO IC trucks can go the distance even in the toughest conditions, thanks to reduced emissions in indoor as well as outdoor areas. 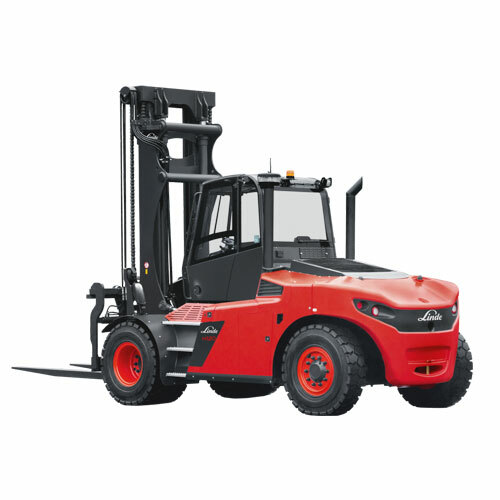 The combination of the hydrostatic direct drive, robust engines, and the Linde Load Control facilitates both rapid and precise operation and exceptional handling performance. At the same time, service costs remain low, as the direct drive operates without a transmission, clutch, or drum brakes, meaning it is totally maintenance-free. Choose from a range of cost-effective diesel, propellant gas, and natural gas engines: the propellant versions generate particularly low emissions levels. The IC trucks in the H20 – H25 EVO range are impressively robust, cost-effective, and safe. Powerful engines and the hydrostatic direct drive – which operates without a transmission or drum brakes – combine to achieve exceptional operational performance. 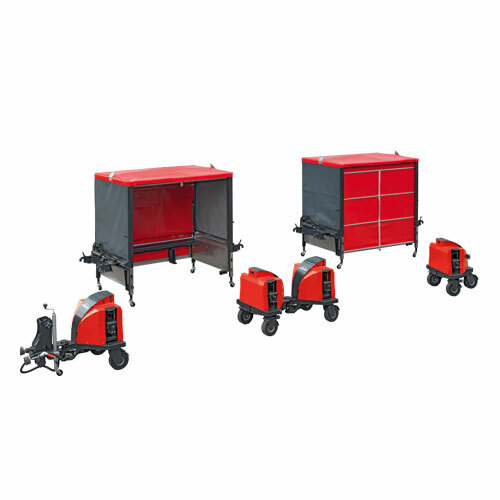 The Linde Protector Frame protects the driver, as the roof and frame form an enclosed unit. The maintenance-free bearing of the axles and tilt cylinders reduces operating costs while increasing turnover. The robust H20 – H25 IC trucks are well-suited to harsh outdoor conditions. The H25 – H35 IC trucks ensure effective load handling with their hydrostatic direct drive and high-torque engines. 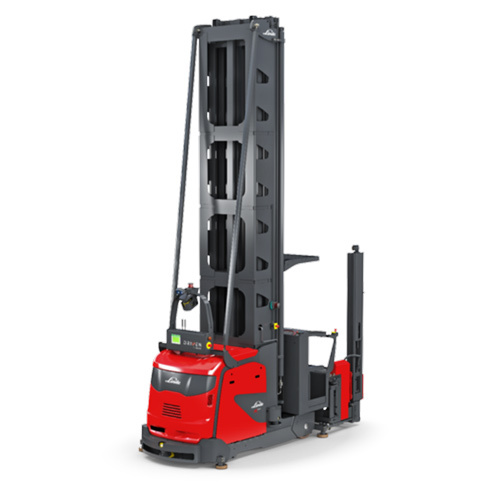 Together with the Linde Load Control lift mast control system, this significantly increases operating performance. This trucks really prove themselves in intensive, continuous use, as many of their components require no servicing at all, hugely reducing downtime. The driver benefits from the fact that the mast and drive axle are decoupled from the driver's cab, so only minimal vibrations and shocks are felt. The quality of the H40 – H50 IC trucks really comes to the fore in especially long and challenging applications. 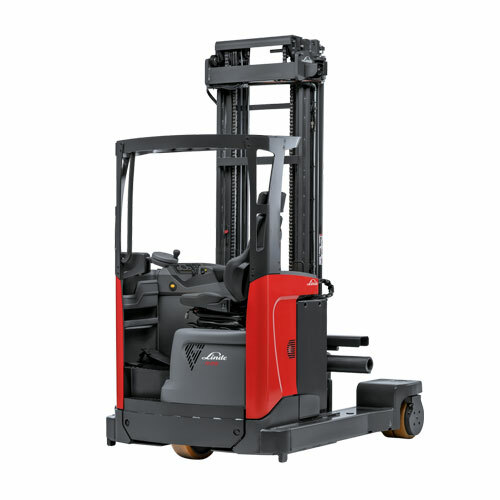 Powerful engines, a hydrostatic direct drive, and the Linde Load Control lift mast control system all ensure consistently high operational performance. At the same time, the truck only rarely needs to be taken off duty for servicing, as the bearings of the axles and tilt cylinders, for example, do not require maintenance. The same applies to the robust direct drive that operates without a transmission or drum brakes. Enhanced safety is assured thanks, among other things, to the Linde Protector Frame, that sees the roof and frame form a single robust unit. The HT100 – HT180 Ds IC trucks are fast and efficient when handling heavy loads: a fact guaranteed by the well coordinated combination of modern diesel engines, transmission, and hydrodynamic drive. This technology ensures exceptionally strong handling performance, particularly for transport over long distances. What's more, drivers of trucks in this class benefit from excellent all-round visibility, as essential components, such as the mast and counterbalance, have been designed for optimal vision. The H100 – H180 D IC trucks can transport even the heaviest of loads precisely, swiftly, and cost-effectively, securing a competitive advantage in terms of handling performance. All this is made possible by Linde's hydrostatic drive, which allows heavy trucks to be moved with millimeter precision. The driver can quickly and smoothly shift between backward and forward movement, while modern diesel engines guarantee high torque and low fuel consumption. Even for shorter distances you need the performance of the transport truck, because the pallet trucks have to master many difficult situations in a short time: Narrow aisles, tight truck loading bays or steep ramps make goods receiving and transport difficult. 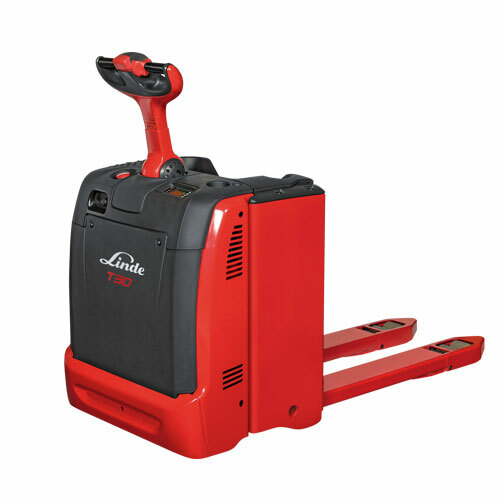 So that your handling capacity stays high under all circumstances, Linde Material Handling offers a large selection of particularly agile pallet trucks. They have compact and precise steering systems. This makes many maneuvers easier in tight environments. The models with electric power steering also profit from powerful motors, which Linde combines with quick-reacting brakes. Often multiple braking systems are used, which complement each other. This makes transport from A to B not only faster, but also safe. 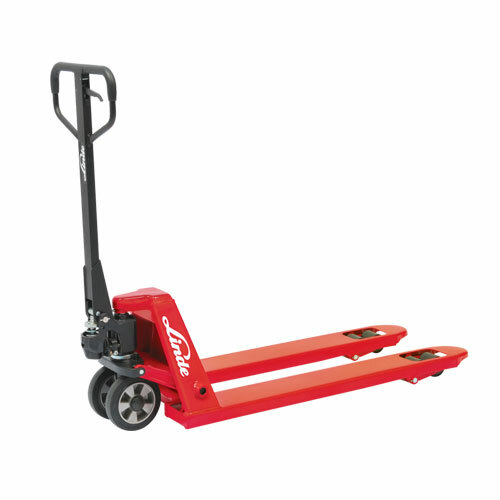 The lifting capacity of the pallet trucks and pallet lift trucks from Linde ranges from 500 to 3.300 kg. The pallet truck T33 R is designed for particularly fast transport processes involving high loads. Two 6.5 kW motors make it possible for the truck to accelerate to its maximum speed in a few seconds. Efficient brakes with ABS functions also ensure that the pallet truck slows down just as quickly. 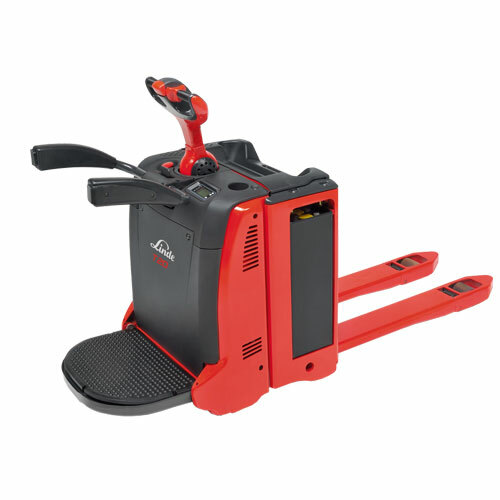 There are also various drive programs which adjust the speed, acceleration, and brake function depending on the pallet truck's direction of travel. The operator's work station has an ergonomic design so that they remain focused when in the fast T33 R and do not get tired. All the control elements can be individually adjusted. The T33 R pallet truck has a load capacity of 3300 kg. The pallet lift trucks M10 X and M10 XE can lift their forks via scissor lift to a height of 800 mm and have a very compact design. This is why these trucks are used flexibly in transport tasks, as mobile working platforms, or for occasional order picking in the tightest of spaces. 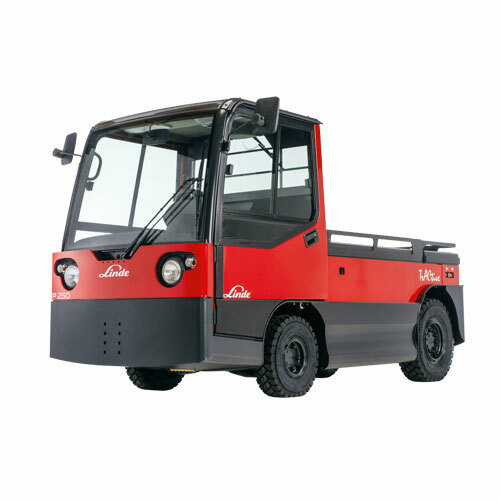 Linde offers two versions: The M10 XE model has an electric lift drive. The operator doesn't have to use any strength to lift or lower the load. In the model M10 X, lifting is initiated manually by the operator using the tiller. The direction of movement can be changed using a single lever located on the handle. Both models have a rugged, warp resistant chassis and a reinforced tiller. The pallet lift truck with scissor lift M10 X/XE can carry and lift a maximum load of 1000 kg. The pedestrian pallet truck T30 ensures efficient transport of heavy loads and quick processes when loading and unloading delivery trucks. Users benefit from a rugged construction which will withstand heavy use: Each fork can carry up to 2000 kg without bending. The entire truck is produced using molded steel. 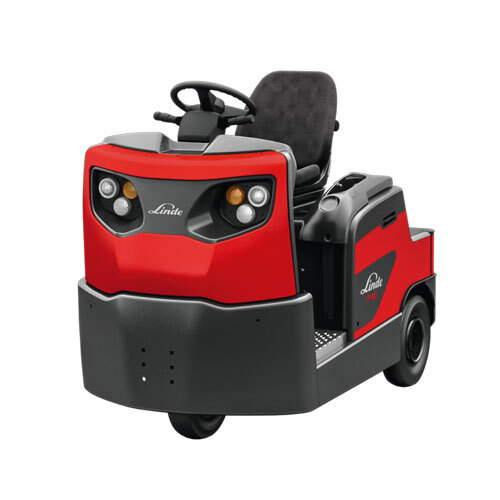 The three-phase motor has a high torque and ensures a good pace when transporting goods. This is also true when the truck has a maximum load or has to navigate ramps. The tiller of the T30 has an ergonomic design so the operator stays focused and works safely. All the controls can be operated with the left or right hand. One hand must always be on the tiller head, however. The T30 can be equipped with lithium-ion batteries, which have a longer life and charge more quickly. The maximum load capacity of the pedestrian pallet truck is 3000 kg. 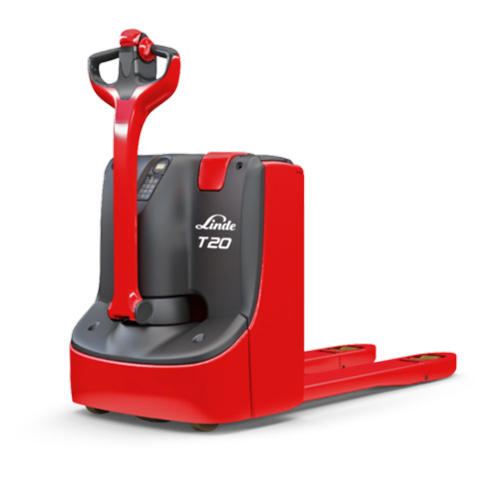 The T20 R pallet truck transports loads quickly and effectively over longer distances and increases cargo handling. Even loading and unloading of delivery trucks races can be done quickly with the T20 R. This is thanks to the 2 kW three-phase motor and the precise electrical steering unit. 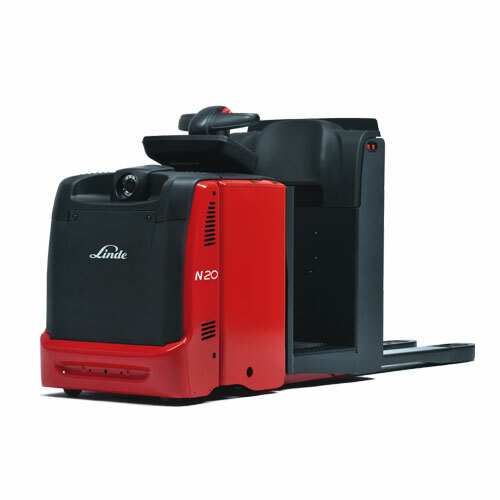 The T20 R has an ergonomic design that ensures focused, rapid work processes. 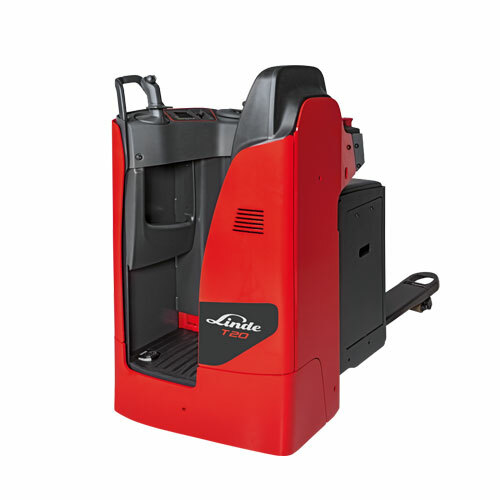 The operator can individually adjust the seat to their needs, reach all of the control elements without effort, and easily change the direction of travel using the Linde double pedal. 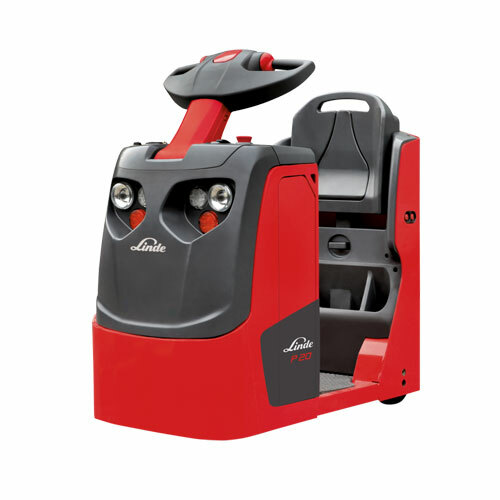 The seat position is important for transporting goods smoothly: The operator sits at a right angle to the direction of travel and has good all-round vision. 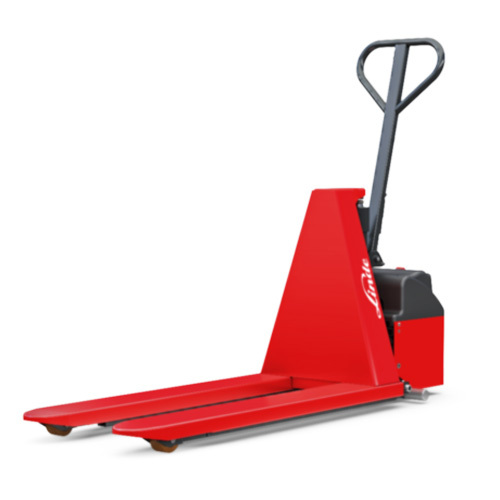 The T20 R pallet truck can transport up to a maximum of 2000 kg. 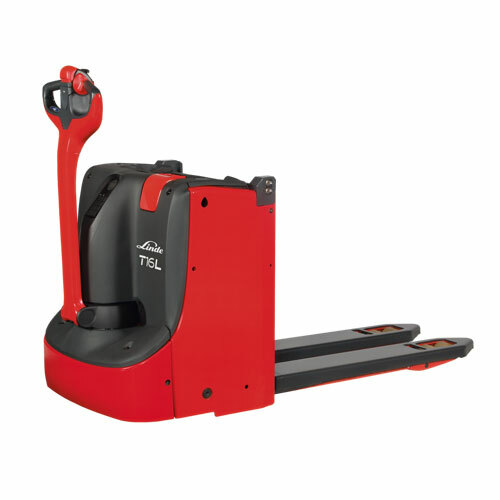 The pallet truck with order picking lift T16 L makes handling and occasional order picking easier. 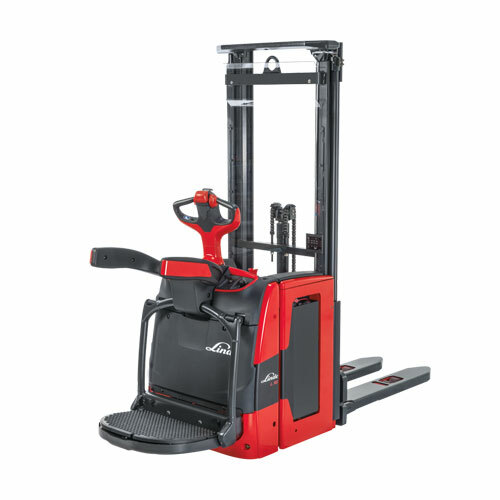 The operator lifts the pallet to a comfortable height and can then deposit or load the goods. In addition, the truck adapts this lift automatically with the optional OptiLift function. The load height for the operator thus remains the same even when goods are stacked on the pallet. A rugged steel construction protects the truck from damage during tough, continuous use. The low chassis covers the wheels and protects the operator's feet. The powerful three-phase motor provides good acceleration, even with the maximum load of 1600 kg. At the maximum lift height, the truck has a residual load capacity of 800 kg. The pallet lift truck M25 has a rugged construction and will not bend under heavy loads. Its steel chassis can take about 25 percent more weight than comparable models of this size. The hydraulics of the M25 are protected from dust and are well suited to long, hard working days, with a minimum of service. The drive wheels and rollers increase handling capacity with their low rolling resistance. The tiller also has a large steering angle on both sides. It's therefore easy to maneuver the M25 in a tight space, such as the truck loading bays. A broad tiller handle protects the hands from injury. The pallet lift truck M25 has a maximum load capacity of 2500 kg. 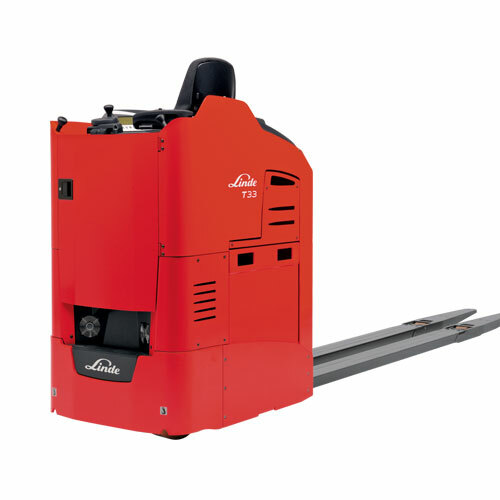 The T14 S, T20 - T25 S/SF pallet trucks have a particularly narrow chassis, barely wider than a pallet. Together with a precise electrical steering unit, this feature ensures that the pallet truck is perfectly maneuverable. You can increase handling capacity even in constricted spaces. The construction of the platform plays an important role. It is completely separate from the chassis and absorbs most vibration arising from uneven surfaces. The high standing position makes processes safer. 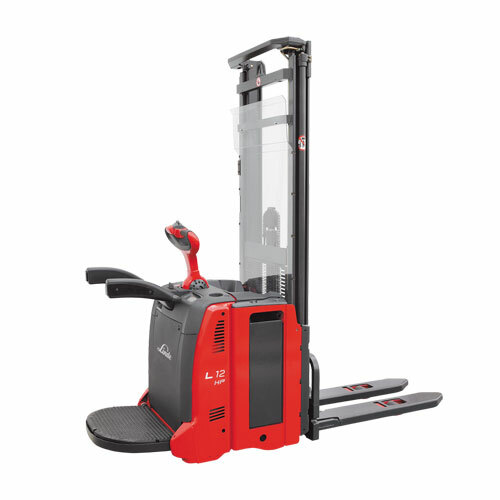 From their position, the driver can keep an eye on the fork, and pick up pallets quickly. 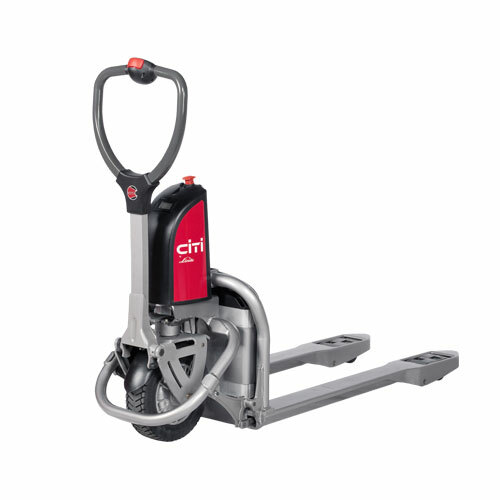 The T14 S, T20 - T25 S/SF pallet trucks have a maximum lifting capacity of 1400, 2000 or 2500 kg depending on the model. 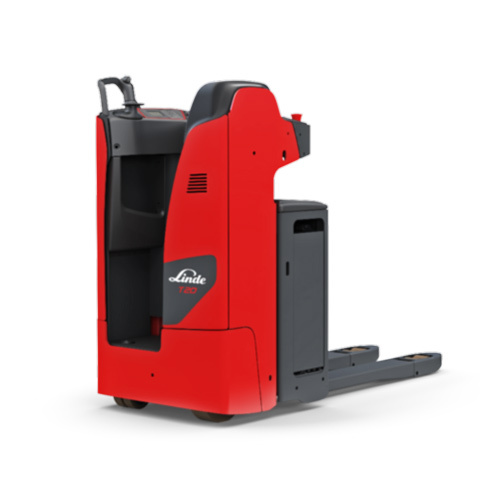 The pallet lift truck M25 Scale+ has a scale system with a tolerance of only 500 g. This means users are spared a trip to an external precision scale and save time when loading a truck. Linde also offers printers and memory cards if the user wants to store the measurement. For example, deviations from actual order quantities can be documented. The warp-free construction of the M25 Scale+ ensures high handling performance. In this way, the truck not only has an extraordinarily high load capacity for the class, but can also handle tough, continuous use with no need for servicing. The operator's hands are protected by a wide tiller handle. The M25 Scale+ pallet truck can transport weights of up to 2500 kg. The MT 15 electro pallet lift truck has a compact chassis, can be taken onto a truck, and makes many maneuvers inside the truck or in narrow aisles much easier. The operator doesn't have to use a great deal of power, because the powerful AC motor drives all of the movements of the truck efficiently. Control is effortless with only one hand using a few switches on the tiller handle. The long tiller provides safety because of the distance between the operator and the truck. In addition, electromagnetic brakes reduce the speed when the operator releases the butterfly switch on the tiller. A low chassis stops your feet from getting under the pallet truck. The motor is effectively protected from impacts by a metal shell. 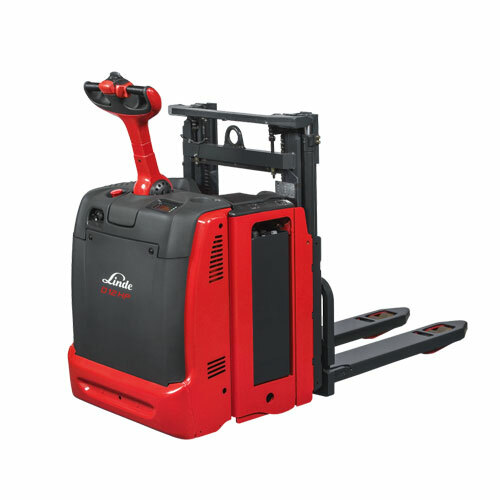 The MT15 electric pallet lift truck has a maximum load capacity of 1500 kg. 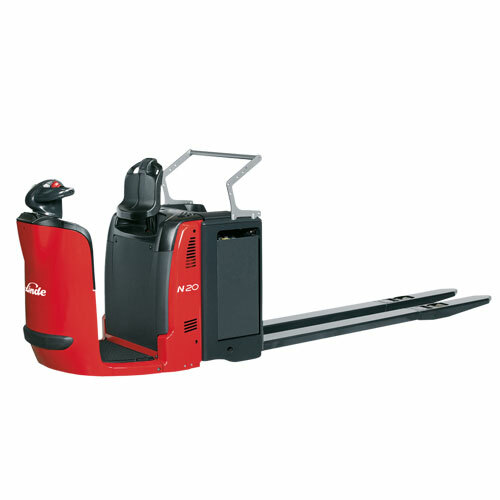 The T20 - T25 AP/SP pallet trucks offer tailored ergonomic working conditions for the driver. Linde's basic concept is flexible. In the AP model, the driver can move the standing platform up, and fold down the steering tiller. The platform truck changes into a full-service pedestrian model as needed. In contrast, the SP mode has a fixed standing platform. The truck has an e-driver controller from Linde, with which the operator stands at a right angle to the direction of travel and can see both forward and backward. Many maneuvers are therefore much easier and can be done more quickly. 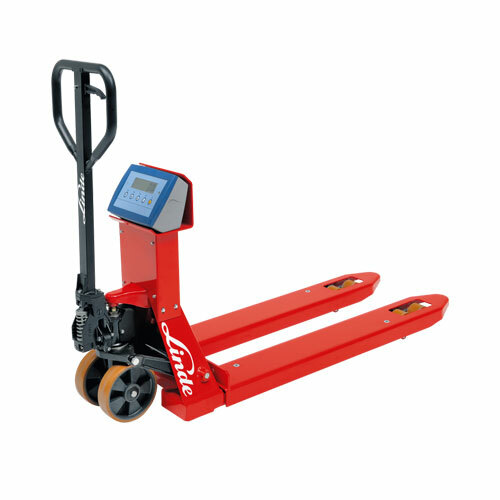 The pallet trucks have a maximum lifting capacity of 2000 or 2400 kg depending on the model. Lithium-ion batteries are also available. The T16, T18, and T20 pallet trucks have a particularly rugged construction. For example, tiller and motor cover are made of fiberglass-reinforced materials and can work reliably and continuous for a long time, maneuvering, order picking, and transporting. The low chassis provides more safety. It covers all of the wheels so the user's feet do not come into contact with them. The tiller is mounted at a very low point on the truck. The operator is therefore at a safe distance from the pallet truck with the tiller folded down. The effective electric braking system is also important for the safety of the T16, T18, and T20. The trucks accelerate quickly with the powerful three-phase motor and the booster effect provides even more output in difficult situations. Depending on the version, they boast a lifting capacity of 1,600 to 2,000 kilograms. Suitable for any transport distance and stacking height: Linde has a wide range of electro pallet stackers for loads between 800 and 2,000 kilograms. Their strengths can be utilized anywhere requiring fast work and where safety is of the highest order, even if there isn't much space available. That's why these pallet stackers, with their narrow chassis, are not only agile, but handle the load with particular precision. The pedestrian double stackers D06 and D08 are ideal for easy logistical use, for example where there are rapid transport and order picking processes in the supermarket. Despite a lift height of 2024 mm, the trucks are very compact. This makes working in narrow warehouses easier. And using the innovative creep button, the truck can still maneuver precisely even when there is very little space available. The innovative caster system provides even more safety. It improves traction and stability even on uneven floors. The operator has a good view of the load and the path through the special mast construction. The D06 and D08 pallet stackers can simultaneously transport two palettes with a total capacity of 600 kg or 800 kg respectively. 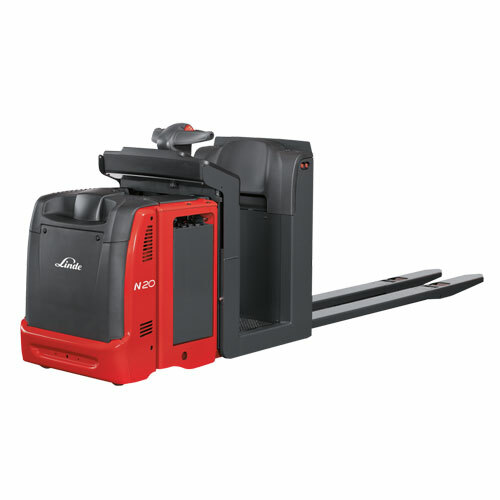 The electric double stackers D12 - D14 are very flexible when it comes to storing and removing goods, for longer transport distances with two pallets or for quick order picking processes. 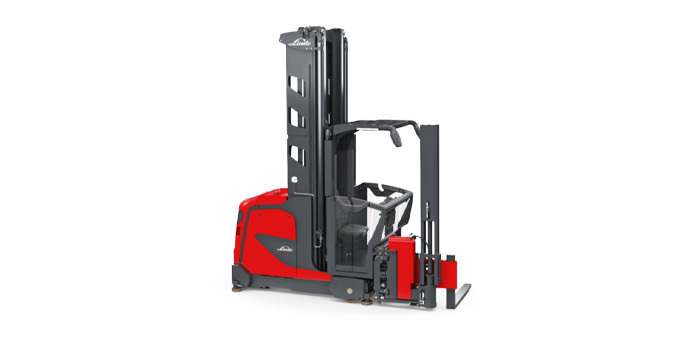 A high working speed is also guaranteed through the Linde OptiLift controls. It enables precise lifting and lowering of the load. At the same time, the operator maneuvers the truck with no effort using the electric steering unit and adjustable steering resistance. The truck is also very agile with its compact chassis. Thanks to the high performance 3 kW three-phase motor, the double stacker can reach a maximum speed of six kilometers per hour. Its lifting capacity is 1200 to 1400 kg. The D12 S/SF pallet stackers have a chassis that is narrower than a pallet. So these trucks can transport two pallets at a time, and maneuver within the tightest spaces. In addition, the operator has a high stance and thus a free view of the fork tips. This makes load handling easier. The operator platform is separated from the chassis by a layer of rubber. This protects the body from strong vibrations during travel so the operator can concentrate longer. 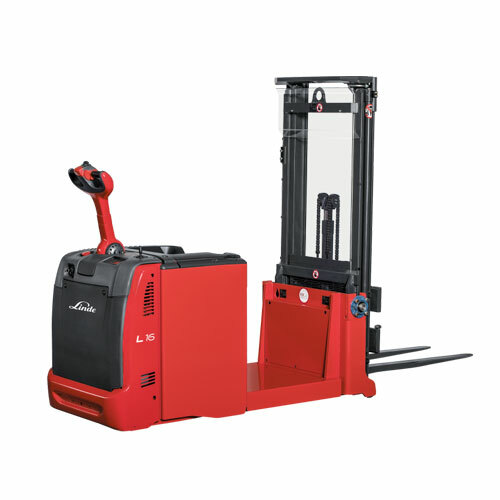 Linde offers the D12 pallet stacker in two standard versions: In the S model, the operator is standing at a right angle to the direction of travel and has a good view to the front and back. In the SF model, he is standing frontal to the direction of travel and always has the load in view. Both models have mast variations for various load heights. The pallet trucks have a lifting capacity of up to 2000 kg. 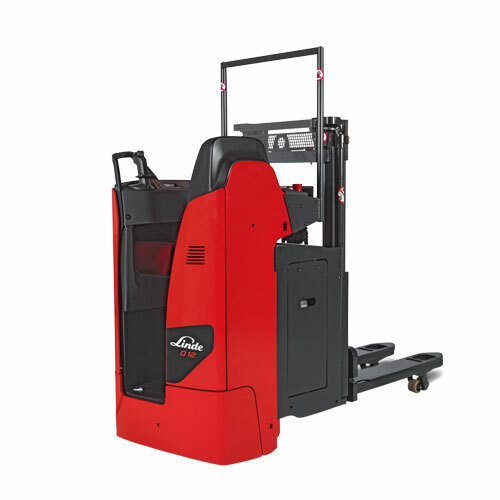 The counterbalanced pallet stackers of the L06 - L16 AC are an effective handling solution if there is too little space available to use a truck or if the transport distance is too short for the electric forklift truck. The operator profits from easy steering and a small turning radius. Automatic speed reduction when cornering and a good view of the load through the mast are additional safety features. The slim chassis is strong and torsion-resistant. Whether storing or picking, distance transport or pallet transfer: The electro pallet stackers L10 - L12, with their slim chassis and good clear view masts make many maneuvers easier, especially where there is little space available. The operator profits from the tiller being mounted at a low point, which guarantees a safe distance from the stacker. There is also a creep speed function for very slow and tight maneuvers. Here the tiller is in an upright position. Overall the truck operates completely intuitively. All control elements are ergonomically arranged within the tiller head and provide for fatigue-free work. The electro straddle stackers L10 - L12 AS quickly and flexibly lift pallets with closed bases and various type of small containers, even if used in narrow aisles. For this purpose, the trucks have a small turning radius. The spacing of their straddle legs can be flexibly adjusted. L10 AS and L12 AS accelerate freely with a three-phase motor. A SafetySpeed function automatically adjusts the speed to the tilting angle of the tiller. The electric double stackers L12 - L14 AP/SP, D12 - D14 AP/SP are very flexible for storing and removing goods, for longer transport distances with two pallets or for quick order picking processes. 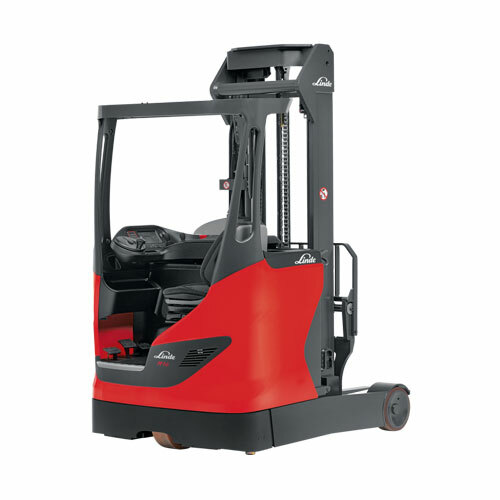 A high working speed is also guaranteed through the Linde OptiLift controls. It enables precise lifting and lowering of the load. At the same time, the operator maneuvers the truck with no effort using the electric steering unit and adjustable steering resistance. The truck is also very agile with its compact chassis. Thanks to the high performance 3 kW three-phase motor, the double stacker can reach a maximum speed of six kilometers per hour. Its lifting capacity is 1200 to 1400 kg. 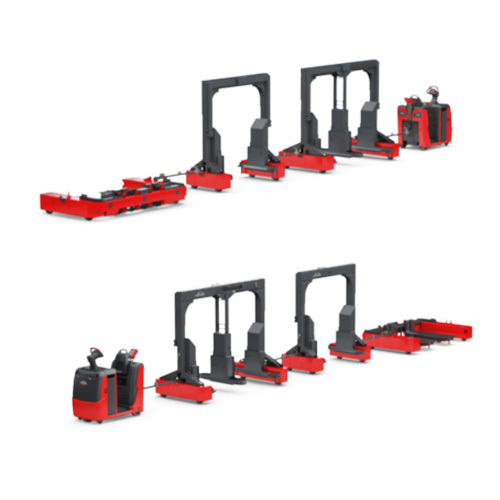 The electro pallet stackers L14 – L16 AS AP/AS comes in two standard versions, so the user has a custom fitted and effective solution available for their area of operation: the SP version with a fixed platform for optimum comfort for longer distances or the AP version with a foldable platform for more flexibility during operation. This version of the truck is more compact. Both platform versions can be combined with the various vehicle versions such as the double stacker. The maintenance-free 3 kW three-phase motor achieves a maximum speed of 10 km/h regardless of load weight. The easy to use servo supported power steering creates more productivity. The L14 - L20 pedestrian pallet stackers enable increasing handling performance with the powerful 2.3 kW three-phase motors and high load capacities. 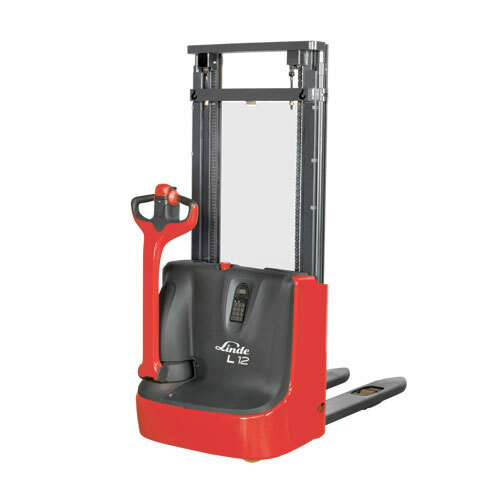 They are ideal for handling in narrow aisles or service lifts. There is an optional initial lift version for more ground clearance. The truck can transport loads up to 2000 kg safely over ramps and uneven ground. The delicate OptiLift lift mast control makes handling easy, because all lifting motions run very precisely. The L14 - L20 AP pallet stackers can be used for many applications and create efficient and quick processes in the warehouse. With a 2.3 kW three-phase motor, the truck achieves a maximum speed of 10 km/h with the platform folded down. It has a load capacity of up to 2000 kg. All of the control elements are located on the tiller head and allow for intuitive operation of the pallet stacker. The truck can also be controlled with very little effort thanks to the electric power steering. 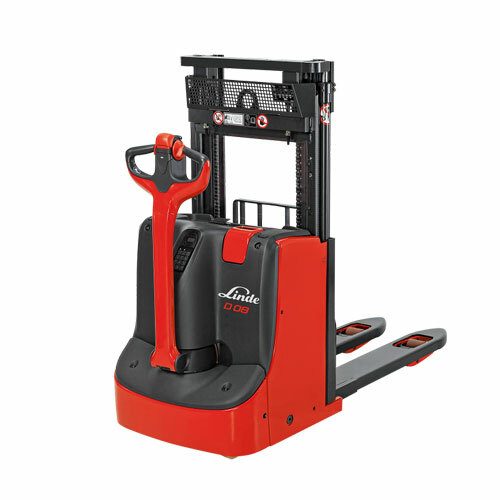 And using the Linde Load Control, any load can be handled sensitively and with precision. A scale installation shows the operator the load weight. The electro pallet stackers L12 - L16 R/Ri with a operator's seat ensure rapid goods transport and efficient stocking at medium heights. The trucks are ideal for use in demanding applications because they can transport two pallets at once. This significantly increases handling quantities. 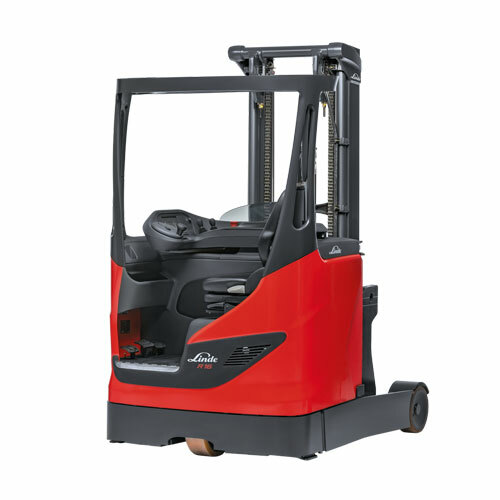 All models have a compact chassis and are easy to maneuver in narrow aisles. The operator is seated at a right angle to the direction of travel and has a good view in both directions. In the Ri version, the truck has an initial lift function, and can easily manage ramps or bridging plates. 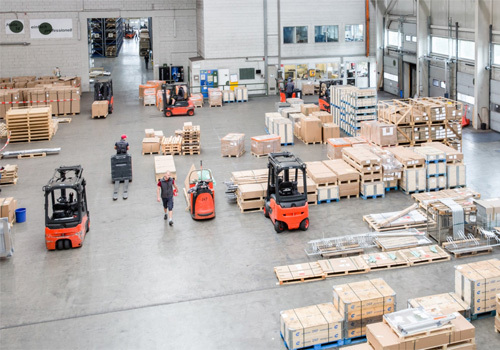 Rapid turnaround and particularly safe handling processes in the most limited space – Linde Material Handling has designed its turret trucks and vertical order pickers specifically to meet the demands of narrow aisles. 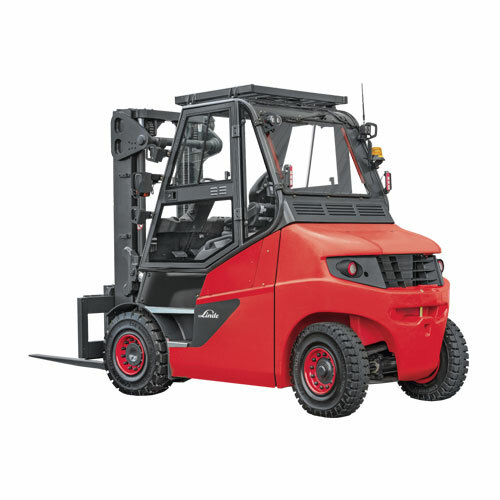 This includes powerful drive and lift engines that enable the forklift to move off and lift at the same time, so that the required location in the racking is reached quickly. 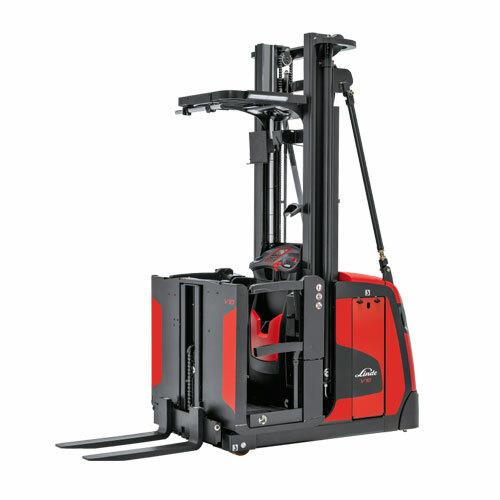 At the same time, the Linde System Control regulates the lift and driving speed according to the weight of the load, optimizing performance according to the driving conditions. Additional optional Linde assistance systems protect against accidents and assist with rapid navigation through the warehouse. Energy recovery during braking and lowering the load saves energy costs and increases availability. Dependent upon the model and configuration, the lifting capacity can reach up to 1.5 tons. 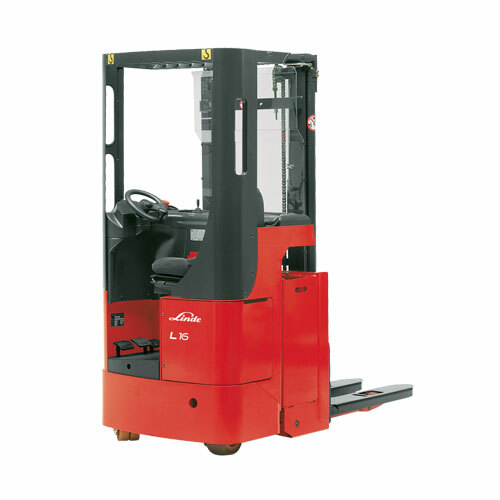 The Linde A order picking forklift embodies a high rate of turnaround in particularly narrow aisles. This is achieved by a modern drive train that even at maximum lift heights can achieve high-speed lifting and travel. 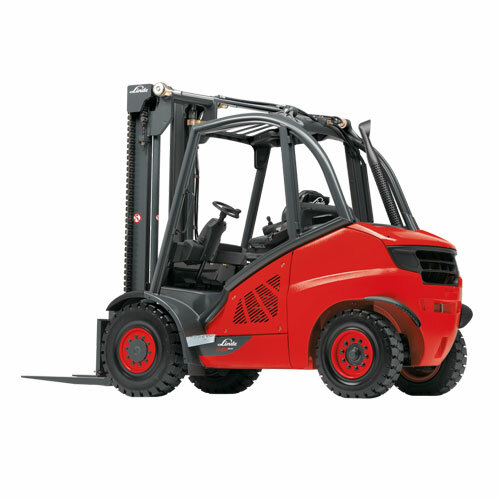 In addition, the forklift can travel and lift at the same time. Just as important are the residual lift capacity, and various camera and assistance systems. They assist with such things as navigation in the warehouse, accident prevention or facilitating rapid handling at high levels. The VNA truck A is of modular construction. The customer can choose from different motors, batteries, lift masts, chassis and many other features to meet his operating requirements. 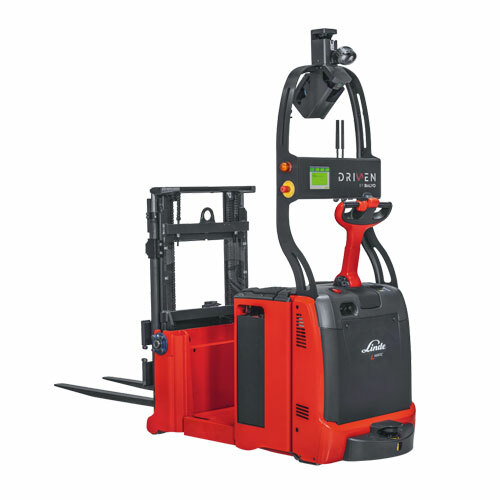 R14 – R20 G-series reach trucks are ideal for combined hall and yard use, that is to say, for transport operations in a changing environment, such as when loading and unloading trucks. Oversize super-elastic wheels, a vibration-damped drive unit, increased ground clearance as well as a vibration-free driver's cab ensure driving comfort and safety. This means that the versatile R14 – R20 G reach trucks enable low-vibration operation on uneven outdoor surfaces as well as efficient load handling in narrow rack aisles in warehouses. They can be adapted to the personal comfort requirements of every driver and are distinguished by powerful engines and numerous safety features. 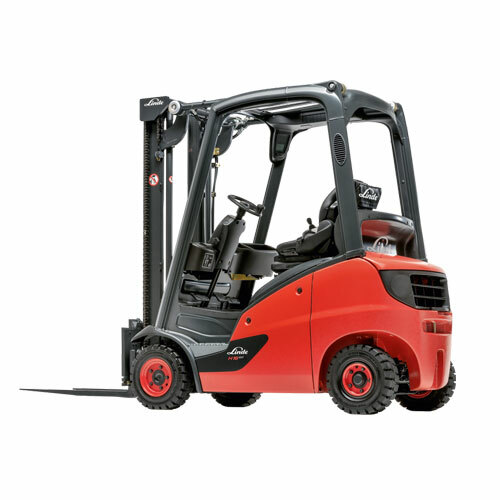 R14 – R17 X reach trucks have an exceptional design, which significantly increases performance, driving comfort and safety. They are ideal for the efficient handling of loads up to 1.7 tons and a working height of over 11.5 meters in narrow rack aisles. The positioning of the battery under the cabin means that the driver has double the amount of space and the field of vision through the mast has doubled, compared to conventional reach trucks, thanks to a new mast concept. The mast is permanently mounted on the chassis. The reach travel movement is now performed by a special fork carriage. This design ensures extremely stable load handling. The position of the battery means that the center of gravity is very low, which leads to high residual load capacities. The special design with extremely short reach travel movements enables narrower aisles in high rack warehouses. 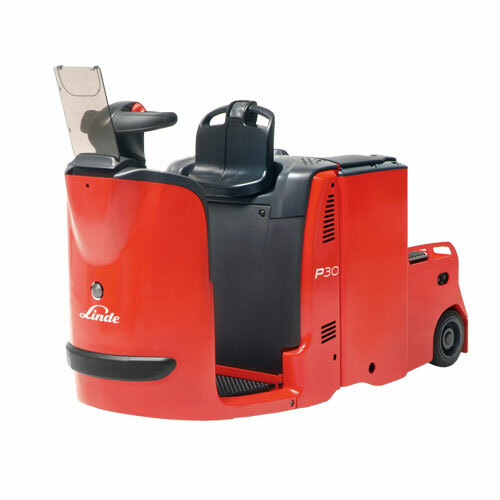 The Linde R10 - R25-product line boasts a wide range of trucks for intensive applications in areas such as contract logistics, the food industry and food trade. The large number of model versions as well as the extensive standard and special equipment make it possible to perform a wide range of different logistics tasks. This includes mast heights up to 13.4 meters, narrow chassis for one-way shelving or the cold store protection able to operate at temperatures as low as - 30°C. In particular, the torsion-resistant lift masts as well as the optional electric linear drive with Dynamic Mast Control, which dynamically compensates for mast oscillation, makes these reach trucks ideal for safe and efficient operation at height. The trucks are also ideal for the double-depth storage of two pallets one behind the other. Ergonomic and individually adjustable control elements as well as a vibration-free driver's seat enable fatigue-free operation. 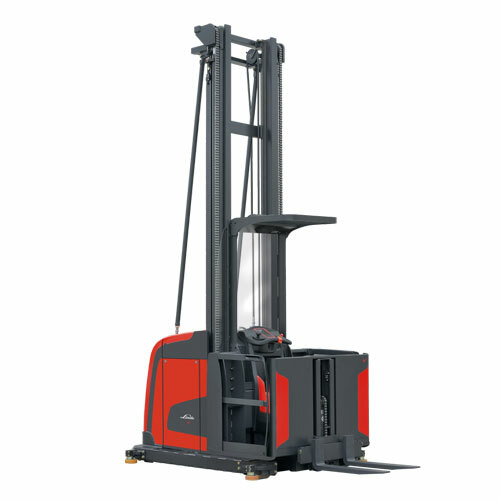 R10 - R16 B reach trucks are ideal for storage and removal at height and in narrow rack aisles. 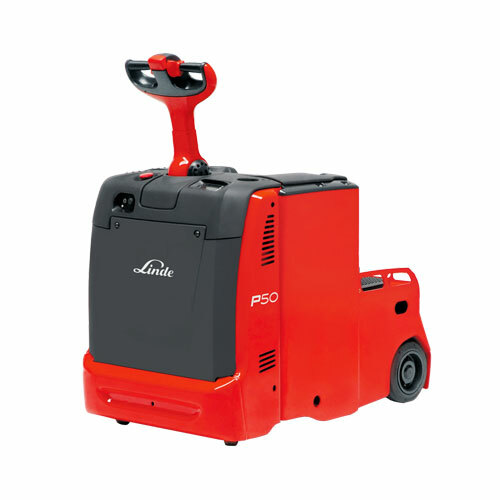 With negligible costs per pallet movement, they provide the necessary output for light to medium-weight tasks in the entry-level class. In addition to the extensive model range, the trucks can be extensively tailored with e.g. mast heights ranging from 2.9 to 7.7 meters. The trucks have a high residual load capacity and boast a high level of comfort for fatigue-free operation. In particular, a vibration-free driver's cabin and individually adjustable control elements help achieve this. 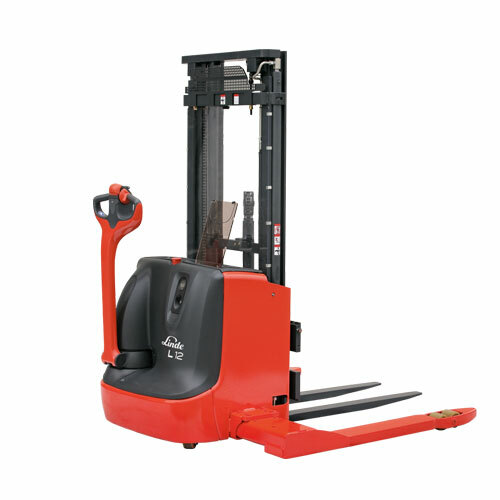 R20 – R25 F four-way reach trucks are specifically designed for transporting particularly long items in narrow aisles. They are not only able to move forwards and backwards, but can also move sideways in both directions. Their adjustable prongs, which can be set to a width of up to two meters, also allow extra-long loads to be transported and stacked. With lift heights of up to nine and a half meters, they are also suitable for use in high rack warehouses. R20 – R25 F-series trucks can even easily handle high loads of up to 2,500 kg. This makes them ideal for long and heavy loads, such as steel girders and wooden beams for the building and timber industry as well as for use on production equipment and in the logistics sector. How quickly the picking goes ultimately depends on the truck operator. If the strain on them is low and the paths are short, this saves power and time. But warehousing processes and types of goods differ depending on sectors and operations. That's why Linde Material Handling uses trucks with a modular design for its picking devices, in order to help to minimize physical strain on the driver and increase the efficiency of the picking process in any working environment. The Linde V10 vertical order picker has been designed for order picking tasks at the first and second racking levels, as well as occasional working up to a height of 6.35 meters. The cab and all the control elements meet all the ergonomic requirements for effortless working. The truck is available with a walk-on loading platform or additional lift. Various lift motors, and chassis, cab and mast variants can be configured in almost any combination. The equipment can therefore be adapted to individual requirements and achieve a high level of picking frequency performance. It can be used with mechanical or inductive guidance or be freely movable - in each case with a maximum load of one tonne. 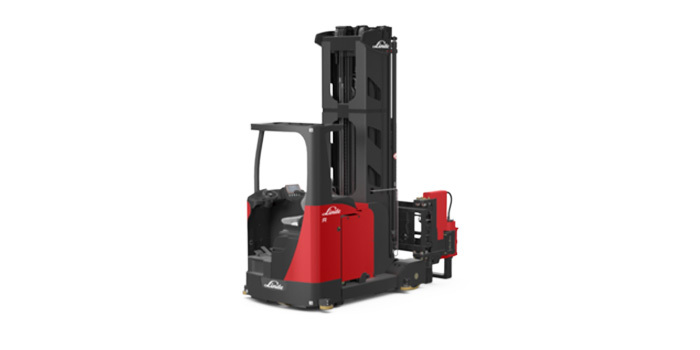 The Linde Material Handling N20 C low-lift order picker reduces strain during order picking thanks to its ergonomic design and intuitive operating concept. The operating platform, for example, is located in front of the battery, which saves the operator having to walk unnecessary distances once they have picked up the goods. Work is more comfortable and less strenuous – especially when "Pick by Voice" is in action, where the operator receives instructions via headset and must react quickly. The U-shaped steering unit has all control elements integrated, and can be intuitively and quickly operated with either the left or right hand. Automatic centering of the steering system makes it easier to drive in a straight line, saving time between picking positions. 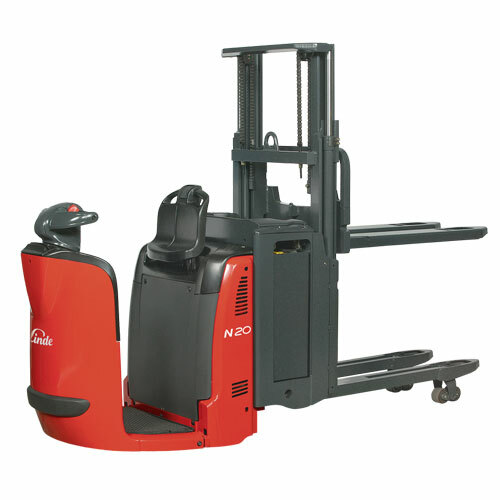 The N20 C low-lift order picker can take on loads of up to two tons. 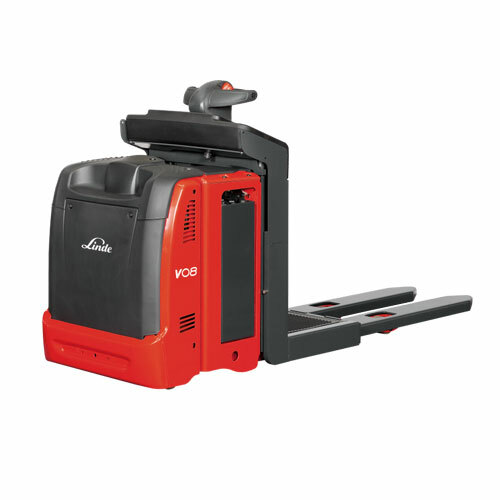 The V08 low-lift order picker with lifting driver platform is available in two basic versions: either with prongs attached directly to the platform for accessible load pick-up, or with an additional lift for a height-adjustable loading surface. There are a wide range of modules and equipment elements that can be individually configured to suit the application at hand. This allows the truck to always offer ergonomic working conditions and ensure high handling rates in the lower shelving levels, thanks, for example, to shortened prongs for the truck version with walk-on loading area. This allows for a smaller turning radius for halls with limited space. Moreover, the operator benefits from the positioning of the control platform in front of the battery, which reduces physical strain and increases picking frequency. Depending on the version, they boast a lifting capacity of 700 to 1000 kilograms. The V vertical order pickers from Linde Material Handling offer the operator an ergonomic working area and intuitive operation. In addition, the vibration-cushioned cabs, low entry height, and low railing aim to prevent fatigue and make picking easier. The high lifting and travel speeds also ensure a high picking output. Linde adjusts the truck to the customer's individual picking tasks on the basis of a modular system. The vertical order pickers reach picking heights of up to twelve meters. Depending on the model, they boast a lifting capacity of up to 1200 kilograms. 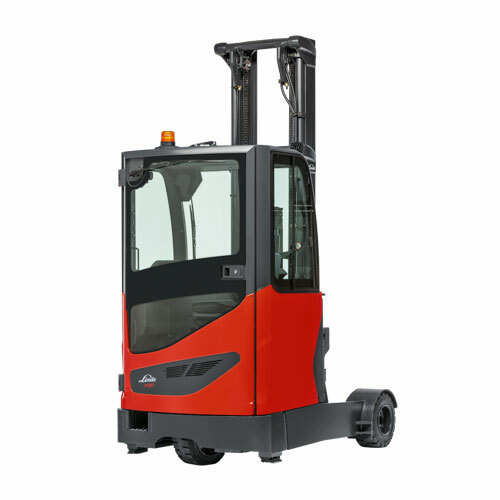 Linde Material Handling's N20 and N20 – 24HP low-lift order pickers not only speed up picking working processes, they also reduce physical strain for the driver. It's all in the design: The batteries are located in the middle of the truck between the driver's cab and the forks. Terminal holders and compartments for working materials offer the driver a control unit well-suited to all order picking processes. This also allows the distance between the driver's cab, the shelf, the two pallets on the truck, and the control panel to be reduced. Plus, the truck accelerates very quickly thanks to its 3 kW three-phase motor. Among the features ensuring enhanced safety are the compact steering controls featuring hand protection and automatic speed adjustment around bends. Made from high quality steel, the robust chassis ensures a long service life, and the low-lift order pickers boast a lifting capacity of 2000 to 2400 kilograms. Lithium-ion batteries are also optionally available. 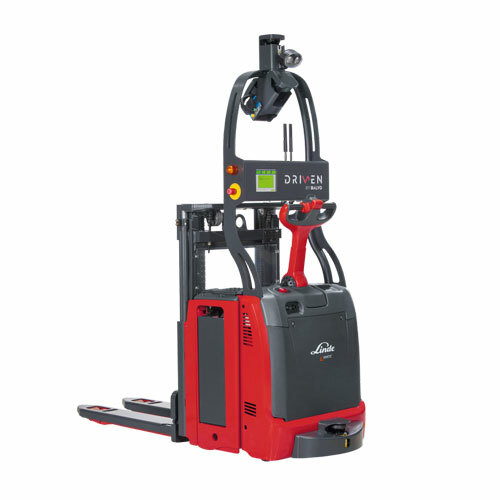 The N20 Vi/VLi low-lift order picker with lifting operator platform improves productivity while picking orders – primarily at ground level, but also at a working height of up to 2.8 meters. The operator benefits from the design concept, as the operator's platform is positioned in front of the battery, with the driving area and forks behind the battery. The design reduces the number of movements required during order picking. As well as the lifting platform, the N20 VLi model also features an additional lift which the operator can use to bring pallets up to a convenient working height, cutting down on strain when positioning goods. The optional compartment area in front of the steering unit, which rises with the platform, is an additional picking aid. The truck boasts a load capacity of up to two tons, and 1.2 tonnes for the additional lift. 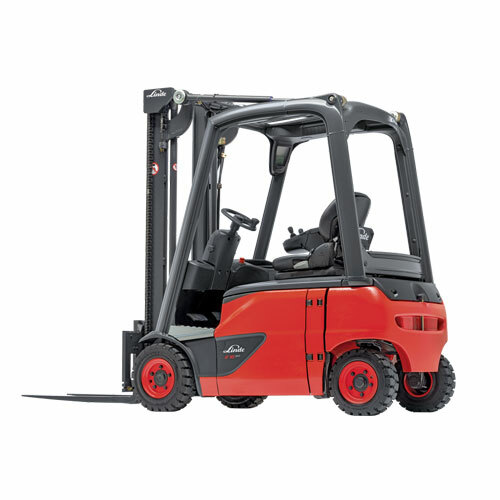 The Linde Material Handling N20 L and N20 Li industrial trucks with lifting masts ensure short distances and fast processes during order picking. 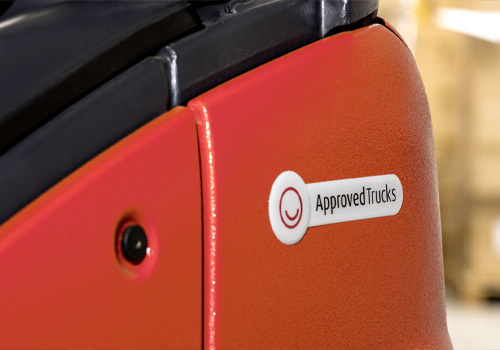 The truck is designed so that the operator platform with a bracket for a terminal or picklist is positioned immediately adjacent to the fork. This shortens the distance for the driver, speeds up the picking processes, and reduces fatigue. The mast also contributes to this, as the operator lifts the pallet at a comfortable working height, protecting their back and saving further time. A wide range of mast versions are available – including a variant for simultaneous picking on two levels, and a variant with an initial lift for better movement over ramps and uneven floor surfaces. The order picker is optionally available with Li-ion batteries. Depending on the model, the maximum load capacity is two tons. The efficiency of transport processes with tow tractors and platform trucks is proven in difficult areas: narrow aisles, small loading areas, steep ramps or uneven surfaces make smooth operation difficult and place strain on the driver. Tow tractors and platform trucks from Linde Material Handling are designed to meet these requirements, and so provide high throughputs. Modern steering systems allow precise driving maneuvers and small turning circles. Comprehensively damped driver work stations ensure that the operators can work without fatigue. In addition, many trucks have several braking systems for greater safety in any driving situation. The tow tractors and platform trucks from Linde Material Handling tow trailer loads of between three and 25 tons. Large trucks with separate platforms can also take a load of up to two tons. The P20 electric tow tractor and the W04 platform truck feature a particularly slender design. Direct, responsive steering makes tight turns possible. As a result, these tow tractors are perfect for transport processes in narrow aisles and tight spaces. Ergonomic working conditions are ensured, for example thanks to the height-adjustable seat. The seat also folds up and down. This allows the driver to control the tow tractor from either a standing or seated position. The P20 and W04 can pull a maximum load of two tons. There is also a different version of the W04 model available with a platform that has a load capacity of up to 400 kilograms. The P250 electric tow tractor from Linde Material Handling transports very heavy loads over medium and long distances quickly and safely. Amongst other things, this is made possible by powerful electric motors and smooth hydraulic steering, which makes the tow tractor easy to maneuver. The turning radius of the P250 is also very small. Hydraulic oscillating elements are positioned between the cab and the chassis. This construction prevents unevenness in the driving surface leading to powerful shocks in the cab. The solid, one-piece chassis surrounds the whole truck. It is particularly rigid and is specially constructed for the tough demands encountered in heavy-duty operation. The P250 electric tow tractor tows a maximum towing capacity of 25 tons and reaches a top speed of 25 kilometers per hour. 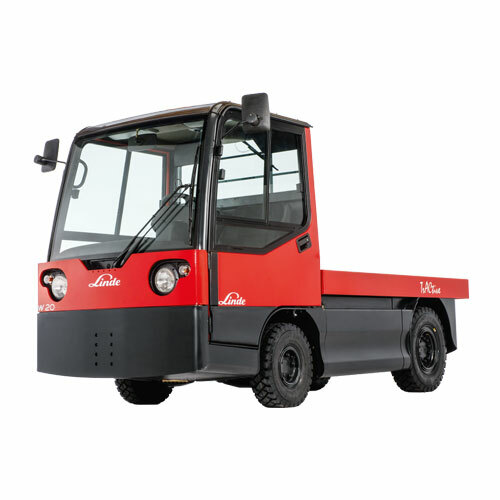 Linde Material Handling's P30 electric tow tractor and platform truck are perfect for flexible and safe transport over short and medium distances; even (and especially) when there is very little space available. The truck features precise self-centering power steering that the driver safely controls using the ergonomic two-handled steering unit. 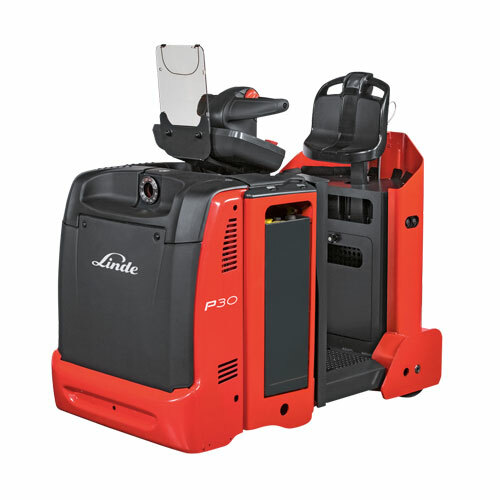 In addition, the P30's compact design makes maneuvering narrow aisles easier. The powerful three-phase motor accelerates quickly to its maximum speed. For comfort and stability while driving, the trucks are equipped with an adjustable backrest and a full-suspension standing platform with a nonslip floor covering. The P30 has a maximum load capacity of three tons. It can reach a maximum speed of 10 kilometers per hour. Linde Material Handling's P30 C and P50 C electric tow tractors allow for efficient and fatigue-free work while transporting goods with load trains. The driver can also benefit from a new platform configuration: the control panel, adjustable backrest and driver standing platform form a u-shaped unit that is completely cushioned, improving comfort while driving. In addition, the electric 2-handled steering unit makes it easier to maneuver when space is limited. The powerful high-torque drive motor ensures high-performance handling. The P30 - P50 C electric tow tractors can pull a maximum load capacity of three (P30) and five (P50) tons. Linde Material Handling's P50 pedestrian tow tractor is designed especially for flexible transport with one or more tow hitches. Users benefit from the easy control, precise acceleration and effective braking that these trucks provide. In addition, the truck is very agile and easy to maneuver in narrow aisles or elevators where there is limited space. The tow tractors are designed to provide stability on three wheels, which allows operators to use the tow tractors on ramps or on uneven surfaces. Its maximum towing load is five tons. It can reach a maximum speed of 6 kilometers per hour. The P60 - P80 rider-seated tow tractors and W08 platform trucks from Linde Material Handling tow trailers with heavy loads and provide quick, safe and flexible processes. This allows the decoupled and spring-mounted suspension of all three wheels. It ensures quiet and safe travel. At the same time, the truck has high towing force and a small turning circle. Therefore, the throughput remains high even if there is only a small amount of space available in the warehouse. The driver benefits from a work station with lots of leg room, an adjustable driver’s seat and steering wheel, as well as intuitively arranged control elements. The P60 - 80 electric tow tractors and W08 platform trucks have a towing capacity of 6 to 8 tons. The top speed without load is 20 kilometers per hour. 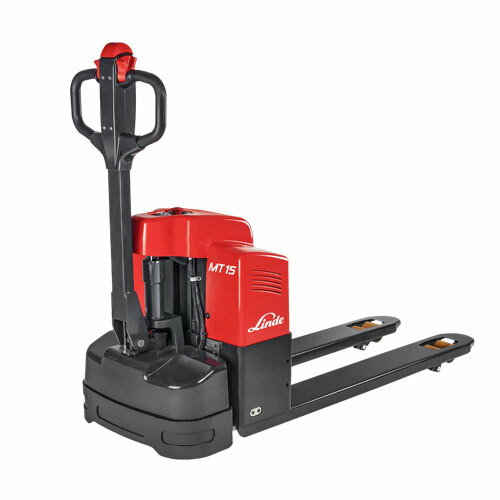 The W20 electric tow tractor from Linde Material Handling transports heavy loads quickly and safely. Its maneuverability is key to this; because of its compact dimensions, the platform truck is very versatile. The energy-saving and precise power steering makes any maneuver easier, even within a small space. This increases throughput. The truck has a robust design: The solid, one-piece chassis protects all the components during difficult heavy-duty operations. The cab is mounted on hydraulic oscillating elements and therefore decoupled from the chassis. In this way, few vibrations and road noises reach the driver. The W20 electric tow tractor can take up to two tons on its loading area. The maximum towing capacity is 4.5 tons. The modularly assembled Linde FT08 – FT20 factory train can be used in both indoor and outdoor areas, and ensures synchronized material flow over long distances in the company premises. The logistics train features chassis suspension and can bear loads of up to 2,000 kg per module. It therefore provides a solution for effective material and goods transportation, above all in sectors with complex manufacturing logistics, such as the automobile or food industries. The directionally-stable steering of the trains provides outstanding driving stability and small turning circles, and with the additional crab-steering system, the trains can also easily be moved sideways. Plus, thanks to quick and easy to fit weather protection, the transported goods are always protected from environmental factors. The Linde Compact FT08 – FT20 factory train enables trouble-free material flow even under narrow conditions. 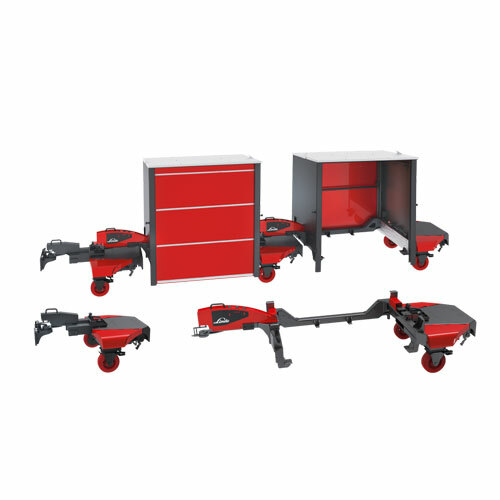 The goods carrier modules consist of single axle assemblies that can be arranged into trains for individual transportation requirements and loaded with Roller frames, material baskets, or other wheeled objects. The trains can bear loads of up to 2,000 kg per segment, with the goods to be transported raised onto the pallet roller frame, pushed into the trailer, and raised for transportation. The directionally-stable electro-mechanical steering delivers outstanding driving stability and small turning circles of just 4.2 meters. The crab-steering system allows the train to move diagonally, and the suspension of the axles guarantees shock-free transportation. The Linde Material Handling LT06 – LT20 series logistics trains are designed for packaged material transportation in indoor and outdoor areas, and under demanding industrial conditions. It boasts robust SE tires and a lift height of up to 200 mm, and it is possible to move loads of up to 2,000 kg per trailer, with up to 6 trailers. With different frame variants and trailer types, Linde logistics trains can be designed to adapt to specific production requirements. Thanks to the flat construction of the C-frame trailer, the transportation of long items is also possible. The trailers are available in C-frame and hanger frame variants, as well as in a platform construction. SAFE, EFFICIENT AND ERGONOMIC IN ANY ENVIRONMENT. 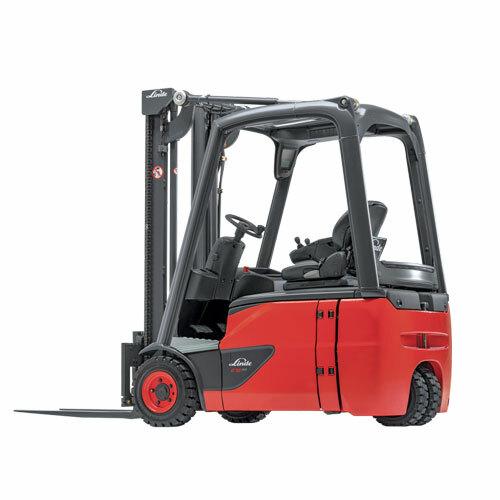 Numerous electric or diesel-operated forklifts, pallet trucks, and other warehouse handling trucks from Linde Material Handling are therefore available in explosion-proof "Ex" versions, meaning that the entire material flow in a company can be conducted under explosion-proof conditions. Components which could trigger sparking, such as drive components, wheels, or even lifting forks, are encapsulated, sealed, or made of highly safe materials. In addition, the surface temperature of individual truck components is regulated in order to prevent explosions. Due to the additional equipment, the logistics trucks retain the cost-effectiveness, handling performance, and ergonomic design typical of Linde. If you need to cover a seasonal peak, prepare for an upcoming event or just deal with the fact that your order books are full, you will need to make it as easy as possible for your workforce and machinery to manage the extra workload. Our short-term “Linde Rental Service” is on hand around the clock to work with your company as a reliable partner. Wherever you are in the world, you can rest assured that we will have just the right forklift truck, warehouse handling equipment or fleet you are looking for, and you know you will be getting state-of-the art technology and the usual Linde quality.